I saw that this is actually a bug/issue and will be fixed (i hope so) in future ... is there any workaround ? This is not a Xamarin.Forms issue, but an issue in Mono. I would suggest posting comments/asking for a workaround wherever you found the bug/issue that you mentioned. WCF has never been fully supported in Mono and likely won't be in the future. When I have asked the Mono team about this in the past they have said (though there is no official word from Microsoft) that WCF is not really being promoted for new projects anymore even by Microsoft, so there did not seem to be a lot of justification for spending the time to fully implement WCF in Mono. I am going to move this to the Cross Platform with Xamarin forum (best match as there is no Mono forum here). 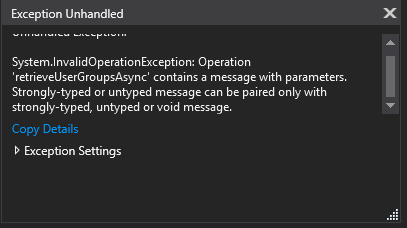 "System.InvalidOperationException: Operation 'retrieveUserGroupsAsync' contains a message with parameters. Strongly-typed or untyped message can be paired only with strongly-typed, untyped or void message." Run svcutil.exe  on the command line in a developer command prompt to generate the proxy. Include the /async flag on the command line if asynchronous methods are desired. In my (admittedly very simple) tests with a template "Visual C# > WCF > WCF Service Application", the various synchronous and asynchronous methods in this kind of proxy all worked fine under in Mono, whether compiled directly into the main executable assembly or compiled into a .NET Standard library referenced by the main assembly.